We’d love your help. Let us know what’s wrong with this preview of Tales of the Green Lantern Corps, Vol. 3 by Steve Englehart. To ask other readers questions about Tales of the Green Lantern Corps, Vol. 3, please sign up. I actually bought (and still own) these individual issues when they came back, but haven't read them in a long while. Strangely, I remember really liking them at the time, but less so on this read through. Steve Englehart has always been a favourite writer of mine, I just found the stories and characters here a bit too simplistic. The premise was always a bit silly, trying to establish several members of the Green Lantern Corps as an Earth-based superteam, when what set them apart was their missi I actually bought (and still own) these individual issues when they came back, but haven't read them in a long while. Strangely, I remember really liking them at the time, but less so on this read through. Steve Englehart has always been a favourite writer of mine, I just found the stories and characters here a bit too simplistic. The premise was always a bit silly, trying to establish several members of the Green Lantern Corps as an Earth-based superteam, when what set them apart was their mission and the fact they were essentially space cops with a 'beat'. It made little sense. Statons art is also a little 'messy' for me as well. I read and nostalgically enjoyed, just found more faults than I expected. 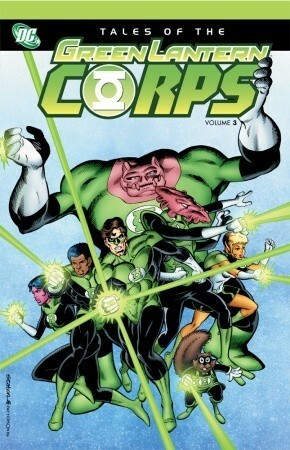 This book, like any good Green Lantern trade, focuses on the Corps itself rather than individual members. That's why GL titles have been so popular and successful of late. Unfortunately, while this tome is periodically so retro that you can nearly hear A Flock of Seagulls and Duran Duran in the background, it's also retro in a BAD way: Hal rejects Arisia's advances but repeatedly calls her "honey". John Stewart can't let Katma Tui introduce herself; he has to interject just so people know she's: This book, like any good Green Lantern trade, focuses on the Corps itself rather than individual members. That's why GL titles have been so popular and successful of late.